Di Garbera, a director of Golding Computer Services, was put forward by companies in the region for the quality and flexibility of the training courses which all said made a real difference to their businesses. 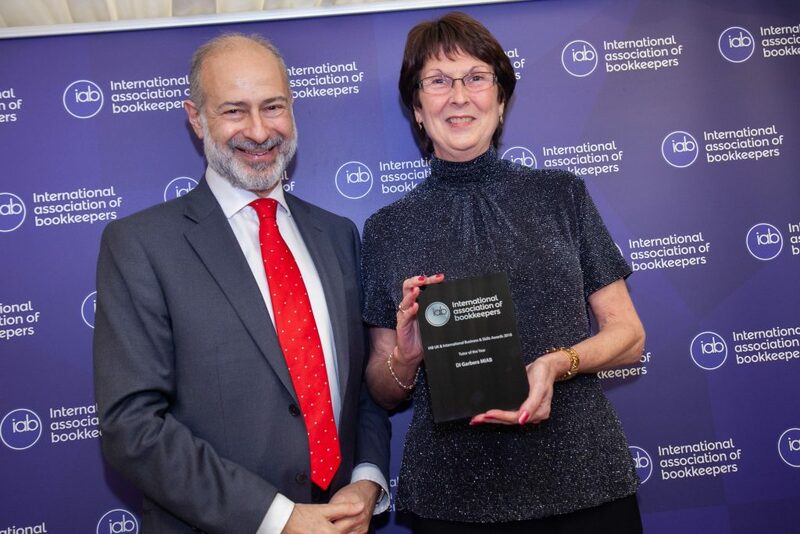 The result was that Di scooped the title of Tutor of the Year at the International Association of Bookkeepers’ (IAB) Awards held at Westminster Palace. The IAB is a membership organisation which provides support and services to bookkeepers, accountants and finance professionals including Ofqual regulated qualifications and anti-money laundering supervision. Di received her award from the IAB President, Fabian Hamilton MP. Goldings, based in George Street, has won gold and silver awards for the quality of its training provided to clients studying for IAB qualifications. Di, who has led the company’s training services for more than 25 years, joined the firm in 1986 as the first employee in a business founded by Vic Golding four years earlier. Di set up the company’s finance system, which she later computerised. With the company supplying many businesses with their first computers and finance software, she became involved in the training programmes devised to help clients get the most out of their purchases. Over the years Di has trained hundreds of people aged from 14 to 66 mainly in the Hull and Humber region and also as far away as Chester, Kent and Scotland. Most of the trainees come from small businesses with fewer than 50 staff, and they benefit from Golding’s success in securing funding and from Di’s expertise and dedication with distance learning. Di also works closely with organisations which help young people who are trying to get into business. She is a board member of the John Cracknell Youth Enterprise Bank (JCYEB) and is a mentor for Making Changes for Careers (MC4C), a scheme set up to help young people who are not in employment, education or training. Di said: “I’m absolutely thrilled to win the award, and so grateful to the clients who nominated me. I can honestly say that the most important part of it is taking the opportunity to get some recognition for our business and to raise awareness of the training courses, because it can be difficult to persuade employers to make time for training. Be the first to comment on "Accolades from clients help Di secure international award"